Adam Cracknell scored for a team-record sixth consecutive game as the San Diego Gulls rebounded from the end of their team- record 15-game standings point streak with a 4-1 victory over the Ontario Reign at Ontario. Defenseman Jake Dotchin scored for the second time in two games, Chase De Leon and Sam Steel scored in the third period and Jeff Glass stopped 20 of 21 shots for the Gulls (21-12-2-3). Cracknell scored on a breakaway one minute, 49 seconds into the second period to give the Gulls the lead for good. Ben Street was credited with the primary assist for flipping the puck off the boards from the Gulls zone. Cracknell collected the puck as he left the penalty box. Defenseman Jaycob Megna was credited with the second assist. Cracknell has scored seven goals in 13 games with the Gulls since being acquired by their NHL parent team, the Anaheim Ducks, Dec. 10, from the Toronto Maple Leafs in exchange for defenseman Steven Oleksy. De Leo scored a power-play goal 59 seconds into the third period, increasing the Gulls lead to 3-1 before a crowd at Citizens Business Bank Arena announced at 8,614. Steel scored the game’s final goal with 7:39 to play, tipping in a pass from Keaton Thompson for his ninth goal in 31 games with the Gulls. The Reign (12-19-4-2) opened the scoring 37 seconds into the game on left wing Matt Moulson’s team-leading 15th goal of the season. The Gulls tied the score 8:39 into the first period on Dotchin’s goal. He did not score a goal in his first nine games with the team, then scored in Saturday’s 6-2 loss to the Bakersfield Condors. The Gulls led in shots, 46-21, including a 16-2 advantage in the first period. The Gulls killed all three of Ontario’s power-play opportunities and scored on one of their five. Cal Petersen (4-8-2-1) made 42 saves for the Reign, the Los Angeles Kings American Hockey League affiliate. The victory extended the Gulls road standings points streak to 10 games, the longest in the AHL this season. AHL teams receive two points for a victory and one for a loss in overtime or a shootout. 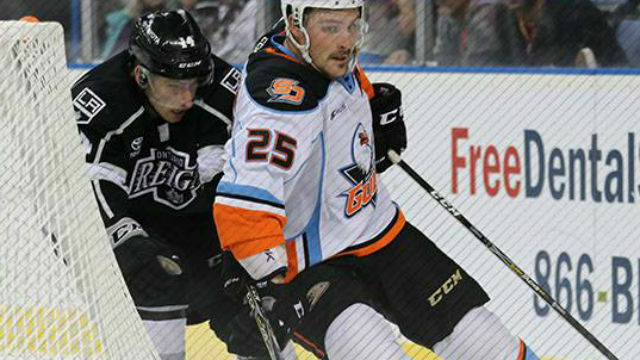 The Gulls have seven victories, an overtime loss and two shootout losses during the streak. Earlier Monday, the Ducks announced they had reassigned centers Sam Carrick and Justin Kloos to the Gulls. Carrick assisted on Dotchin’s goal, giving him a team-leading 38 points for the season. Kloos assisted on Steel’s goal in his debut with the Gulls. He was acquired by the Ducks Wednesday from the Minnesota Wild. The Gulls will next play Friday at San Antonio, the St. Louis Blues AHL affiliate.